The paddock to plate movement was at its best last week in the Lockyer Valley after Qualipac handed over a box of fresh Queensland broccoli to Keith, chef at local restaurant Cafe 4342. Keith worked his magic and created three mouth watering dishes showcasing not only his skills but also the versatility of the humble broccoli. Chef Keith certainly has an appreciation for fresh local produce and it’s not hard to see why Cafe 4342 is one of our favourite Lockyer Valley restaurants. Harvesting of the beans is underway and we are now almost half way through the process for this season. The beans are part of our ongoing association with food manufacturer Simplot with the majority destined for frozen product. Long time Qualipac employee Allan Harch has the task of harvesting the beans, a job that often begins at midnight due to the cooler temperature. Keeping the beans as cool as possible is important for preserving their freshness, especially in our climate and at this time of the year. Qualipac Farms General Manager, Brad Qualischefski has been overseeing the process and is very happy with the results. A lot of hard work goes into the growing stage and it is rewarding to get to the harvesting stage, especially when the results are as good as they are. The product quality is excellent and the yields have exceeded our expectations. From the farm the beans are transported a short distance to our packing shed where with the support of Simplot, we have established a specialised bean line. The beans are washed, sorted and cooled before being transported by train to Simplot’s factory in Devonport, Tasmania where they will be processed and snap frozen. As a proudly Australian company, Qualipac are pleased to be able to work with Simplot in their push to see more Australian produce in frozen products in our supermarkets. With just a few weeks to run on our broccoli season and with the warmer weather now upon us our attention turns to our summer production crops. This year, as well as corn we will for the first time be producing both beans and cabbage as part of our ongoing partnership with food manufacturer Simplot. This summer, Qualipac will be producing over 3000 tonnes of corn, 500 tonnes of beans and 200 tonnes of cabbage which will be destined for a variety of Simplot products. We are currently half way through the planting stage with the majority of the produce being grown in the Lockyer Valley. Simplot have a strong commitment to supplying our major supermarket chains with both canned and frozen vegetables sourced from Australian producers and Qualipac are proud to be able to continue our association with them. It’s great to see the supermarkets supporting Australian growers through their business with Simplot. A lot of the time the focus is on fresh Australian produce but it’s also good to see their commitment to Australian grown vegetables in canned and frozen products as well. Harvesting of the products will commence in November and run through until Christmas. Qualipac’s Sales and Marketing Manager, Kees Versteeg was recently awarded the 2015 Innovative Marketing Award at the Ausveg Convention, Trade Show and Excellence Awards held on the Gold Coast in Queensland. The award was received as recognition from his peers for many years of contribution and success in the industry. Kees has been with Qualipac for over 5 years and has been instrumental in the continual development of our business and we congratulate him on this well deserved award. Today, Qualipac was proud to support the opening of Woolworths new store at Maroochydore on the Sunshine Coast in Queensland. A fantastic display of Qualipac’s broccoli was set up at the store at a red hot price of $1.48/kg. Qualipac Director Troy Qualischefski and Sales Manager Kees Versteeg were both in attendance at today’s launch and were thrilled with the broccoli display. We are almost half way through our 2015 season with both volumes and quality high. Harvesting is now complete on the Darling Downs and we are currently harvesting in the Lockyer Valley. Preparations for our 2015 broccoli season have begun with planting of both broccoli and baby broccoli well underway. After initially starting at the end of January on the Darling Downs, planting has now moved to the Lockyer Valley where we will continue until the end of June. Qualipac Farms General Manager Brad Qualischefski is very pleased with the progress so far. Harvesting will begin in the first week of April and will continue all the way through the mid October. We are aiming to harvest 120,000kgs of broccoli and 6000kgs of baby broccoli a week which will be sold to local, interstate and international markets. We have just wrapped up another successful corn harvest with 3500 tonnes of corn harvested from our farms in the Lockyer Valley just before the end of the year. The harvest marks our fourth year of partnering with food manufacturer Simplot. For Qualipac Farms General Manager Brad Qualischefski it has been a challenging crop. While corn is not one of our major crops in terms of production it is important for crop rotation. The crop fits in perfectly between out other crops and the tops of the plant left behind after harvest are excellent for the health of the soil. So where did the corn end up? If you have enjoyed some Edgells canned corn or Birds Eye frozen corn lately, there is a good chance it was grown by Qualipac. 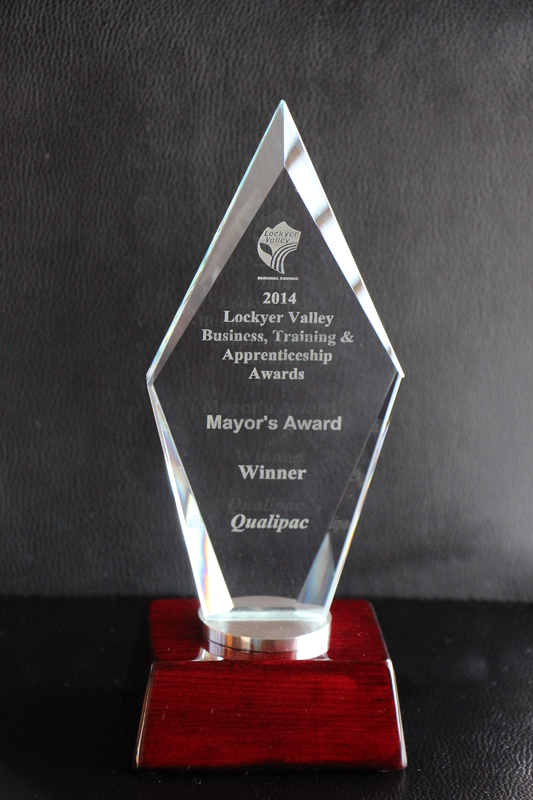 Qualipac has been awarded the 2014 Mayors Award at the Lockyer Valley Business, Training and Apprenticeship Awards which were held over the weekend. Presented by the Mayor Cr Steve Jones and event host Andrew Daddo, the award is in recognition of outstanding performance by a business in the region. Qualipac co-owner and director Troy Qualischefski attended the awards night and received the award on behalf of the management and staff at Qualipac.